The advent of digital photography saw a vast increase in the number of photographs taken as invariably those extra pictures are taken to ensure that we capture that elusive perfect image. In theory on downloading the pictures the best image of each scene is retained and the extras deleted. In practice for many of us there are more pressing demands on our time and the net result is a large file of images sitting on our computer that cannot be conveniently viewed. What many of us need to be able to do is to put the best images into an impressive looking slide show with the minimum of time and fuss. 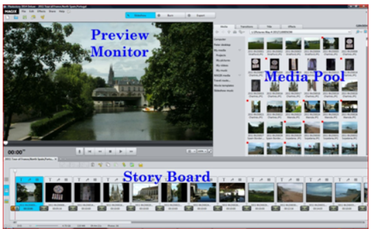 Magix Photostory 2014 Deluxe has a wizard that can do this automatically adding transitions and music to create an impressive slide show, all it asks from you is to select the photos to be included and to answer a few questions. However, if you have the time, Magix Photos are loaded into the media pool on the updated interface which now includes touch features from where those required can be quickly dragged to the Story board. Here the length of time that each picture is displayed can be set and images rotated if necessary. Photostory 2014 Deluxe can of course do so much more, allowing the user to control every aspect of the slide show. Loading the programme from DVD was straightforward but one needs to be careful to ensure that the correct boxes are ticked as some option choices have been reversed from the norm. The programme is straightforward to use especially if a few moments have been spent watching the quick start video provided. Photos are loaded into the media pool on the updated interface which now includes touch features from where those required can be quickly dragged to the Story board. Here the length of time that each picture is displayed can be set and images rotated if necessary. Switching to timeline mode displays the images as objects. Handles on the objects can be dragged to modify the display time or to fade out an image. Images can be optimised with an extensive range of options including artistic filters and distortion effects. Dynamic camera movements can be added such as zoom and pan while picture in picture effects are easily created using one of the many supplied templates. The range of text effects should suit every need from simple scrolling titles to complex 3D animation. From the media pool music can be added to the slide show either from the extensive range supplied by Magix or from your own media files. The programme will automatically adjust the music to fit the length of the slide show. The import wizard which can transfer images from cameras and storage devices directly into your slide show and includes support for all camera formats. The Slideshow Wizard which can create a complete slideshow and requires a minimum of input from the user. The finished slide show can be saved on your computer as a video file or burnt to DVD. It can be exported to a mobile device in a format to suit a tablet or phone or uploaded to sites such as Youtube or facebook. The new 4K Ultra HD format is supported in this version. An excellent product that really does make it quick and easy to create a stunning slideshow complete with music and then export it to your favourite device. Somehow it achieves this while still allowing the professional user total control over every aspect of the slideshow. I found the product easy to use and the extensive help available including context help, a PDF Manual or from the online Magix multimedia community will rarely be needed. It has not been possible to mention all of the features present in this product but one I particularly like as a regular traveller is the ability to create animated travel routes to include in my slideshows.